Business cards are one of the least expensive promotional items you can purchase for your small business. But don’t let the low price tag fool you; cards have a big impact on your brand, especially if you run an online business. Cards put a piece of your company in someone’s hands, which instantly increases your credibility in their eyes. That said, cards are one of our most popular products. Consequently, we get a lot of questions from clients about printing their own cards, especially from small biz owners and startups. Our staff is always here to discuss your project specifically, but I thought it would be helpful to address frequently asked questions here on our blog for folks contemplating a new print marketing campaign. How Many Business Cards Do I Need? The answer depends on your marketing goals and practical needs. Startups tend to place orders in small quantities, such as 50 or 100 cards, and that strategy allows them to test the waters so to speak. Still, ordering a series of small print jobs may end up costing you more in the long run. If you already have your logo, typefaces, etc. finalized, you can save money by buying 1,000 or 2,000 cards at once. Of course you will need to purchase business cards in bulk for trade shows, conventions, networking events, and employees who travel frequently, such as sales people. 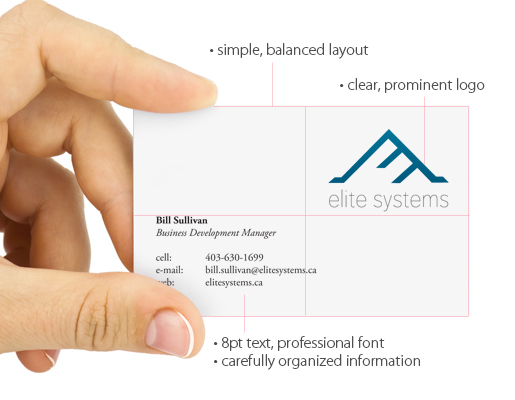 What are the best fonts for business cards? Any designer will tell you that typography matters more than you realize. As a business owner, you want to present yourself or your employees as well as the company in a professional manner. The right font also expresses your brand’s personality and helps sends a clear message about your image. That said, popular fonts and styles vary considerably by industry. For example, doctor fonts tend to be traditional whereas advertising agencies often adopt modern or custom typefaces. There are literally thousands of fonts to choose from; some are free and others are premium i.e. available to download for a free (usually between $45-$200). If you’ve having trouble figuring out where to start, don’t feel overwhelmed. The perfect font will find you when it thinks you’re ready. What size font should I use for business cards? We get this question all the time in some form or another, although it tends to come from irate people over the phone. The main concern with business card font sizes is the text being too small. It doesn’t matter how big the design looks on your giant Mac monitor; your text should be 8pt. at a minimum in order to be readable. Remember this when you are viewing the design at 100% in Photoshop, Illustrator, etc. The font may be legible on screen, but in reality you are seeing a much bigger version than the actual printed piece. In general, 8-12 pt. font works well for your important contact information. The best way to preview your font size is to print out a copy of your business card in its actual size with your home or office printer. In addition to size, you should also consider the thickness of your chosen typeface. Thin may be in for the fashion industry, but skinny letters are a no-no in CMYK world. In this case, the word weight refers to the thickness or width of the letters. Typefaces, especially premium fonts, may come in several different weights from light to bold. If you’re already working with thick letters, you may be able to get away with the light version. Otherwise, stick with regular or bold weights to ensure legibility. Should I hire a designer or make my own business cards? We offer in house creative services, so we’re big believers in professional artwork. When you pay for pro work, you see a big difference in terms of ROI. This is especially true if you’re rebranding your business or have a cool concept but aren’t sure how to put the plan into action. Another reason to hire a designer with print experience is simply peace of mind. Put your project in skilled hands and you will feel more comfortable with the whole printing process. That way you know your marketing campaign won’t fall victim to rookie mistakes, such as border issues, artwork getting cut off due to improper arrangement, etc. Please keep in mind that prior print design experience makes a huge difference. No offense to our friends in the web design community, but print requires a degree of technical knowledge along with creativity. For instance, web projects rarely demand individual color output adjustments. Pro print designers already know about CMYK percentages and uber specific ink stuff.